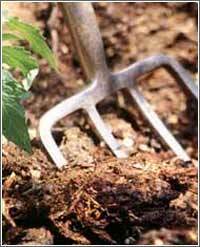 Full fledged gardening season begins in March, an ideal time to plant trees. The ground is usually open and the new trees are dormant. It is also a time before the mad spring rush. For the past few years I have only thought of planting trees, rather than actually doing so, since there are only a few places on the property that I feel really need some. At the front corners I had planted trees that subsequently died. Those are challenging spots ever since the county dug out my good dirt for their new ditches and replaced that dirt with horrible, no good, offscouring of the earth dirt. Who knows where it came from! Subsoil clay to cover the drainage conduits. I’m muttering out of the side of my mouth, still, after all these years. Sorry, friends. This year I may try to put in trees, again, maybe Prairie Fire crabapple to match the ones flanking the driveway. Rarely do I have a retrospect in March, a month of beginnings, usually… but this year is different. With our mild winter it hardly appeared as if the garden season had closed, before it reopened again. I felt I understood what it might be like to live in a mild Southern climate with their year around planting and gardening opportunities. 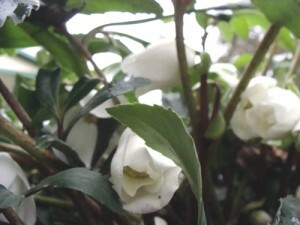 One reason to feel that way is largely due to the Helleborus niger,”Jacob”. I can’t seem to get over the fact that it has bloomed all through the winter right from the proverbial “Christmas Rose” time of Christmas week. The cold spells darkened the blooms but did not stop their appearance, and the foliage was fairly evergreen. It was an entirely new experience for me to see flowers in the midst of a calender winter. My pyracantha also kept its evergreen appearance, nestled close to the house wall as it is.